Microscope is a social game which I should probably write a more thorough review of at some point. For the time being, let’s say it’s a group storytelling/improv-acting game that I’m entirely in love with. The more literature-nerdy you are, the more it’s likely to appeal to you. All you need is a few players, some note cards, and something to write with. Sadly, I live in Japan, where local English-speaking acquaintances are in relatively short supply and often busy. I have friends willing to join me in a game online, but this raises the technical question of what to do about the note cards. The format demands something that can be updated in real time, so simply emailing a text document around would be too clunky to work. Two elements were needed. The first was a text medium to take over the role of the note cards: something that allowed maximum visibility of the history being created, allow new material to be inserted into the middle, and allow real-time updating that everyone could take part in and see. The second, an audio medium to allow smooth communication. Attempting to run the entire session by chat or email would, at best, eliminate the ability to play through scenes (the “improv acting” portion of the game) and at worst, bring the attempt to a grinding, anticlimactic halt. My initial idea was to use Google Wave, given its billing as a real-time group text editing tool, but on the suggestion of one of the players, we switched to Trello, which I’ll cover in greater detail below. We began our session using a G+ video “hangout” for verbal communication, but technical problems with two people’s cameras forced us to switch to a group chat on Skype. There were four players for the session. All of us had read the rules; two of us had played once before (together) with a different group when I first got the game. I was a little worried that this combination of firsts – unfamiliar technology supporting an unfamiliar style of gameplay using unfamiliar rules – could be disastrous, especially when you factor in the potential personality clashes that come with any social game. Kaynahara*, things went nearly as well as could ever have been hoped. Aside from a couple minor hitches, the technology performed so fluidly as to become invisible: a smooth, clean vehicle for the group storytelling. 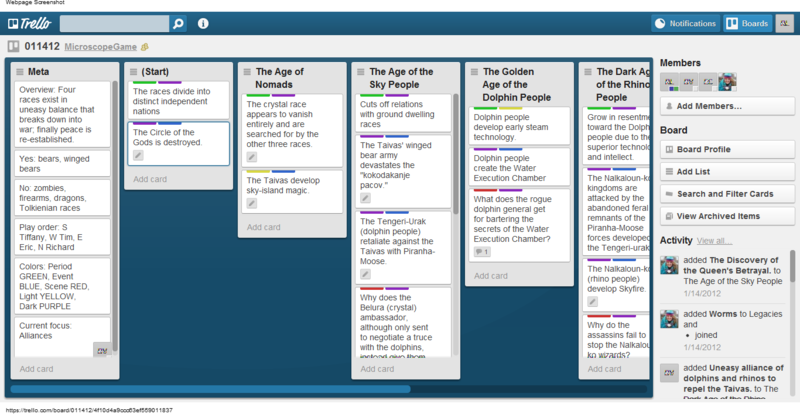 Although in moving from Google to Skype we lost our video connection, I at least never missed it; I spent all my time looking at the Trello “board,” so voice was sufficient. And in contrast to the vertical text-centric structure of Wave, the list-and-card structure, with its color tabs and other options, fit our needs to a surprising degree. I was left with the satisfied feeling of having been given truly useful tools before I had even realized I might want them. Trello is a web-based application that I’d never heard of before this morning. According to the (incredibly sparse) Wikipedia page, its intended purpose is “project management.” Signup is free, and can even be done through your Google account. When you’re in you can create groups (“organizations”) and invite people to join, and you can create documents (“boards”) that invited members can freely edit. Each board includes a set of “lists” that line up horizontally on the page; add enough and you get a scroll bar that pops up at the bottom. Each list can contain any number of “cards,” which themselves can hold notes and checklists, be voted on and given due dates, and be color coded. Members’ icons can be dragged to assign people to particular cards as well. Enough cards in a list, and it develops a little vertical scroll bar of its own rather than the entire page expanding. Lists and cards can be rearranged at will, even moving cards from one list to another. We set things up with our palette and other administrative details of the game on the far left, and the legacies on the far right; the member-assignment function came in useful here. All the lists in between became our Periods. I was a little worried that the width would lead us to forget things out of sight and focus on a narrow band of the history, but that seems to have not been a problem. There was some bunching up of created elements, but that stemmed mostly from the flow of interest and the fact that we only got one Focus each. Trello was not without issues. While the interface was incredibly intuitive for the most part, it would have been a lot more daunting to get over the initial hurdle without the video on the front page… which becomes inaccessible if you’re signed in. It took us a while to figure out how to edit the titles of lists and cards (you have to click on the title – in the main window, for lists, but in the card-edit window for cards) and then wait a moment for an editing box to appear). Worse, if you try to use the “activity” item for notes, it seems that it can never be edited, only deleted and rewritten. Lists cannot be customized with colors or other elements the way cards can. The colors themselves were hard to find (hover on a card to see a down arrow on the right; click on that, then on “labels” in the list that pops out, and then click on all the colors you want to assign). And a couple of times, my typing was inhibited by lag; there might be limits to how much information the application can handle at a time. Despite these problems, I was overall incredibly pleased with Trello’s performance. The visual structure followed what you’d get naturally from using cards on a tabletop. We also were able to pack in detail without cluttering the space, while retaining visual cues telling us where to look for information that wasn’t immediately obvious. We were able to use the color tabs to effectively distinguish Events from Scenes and light Tone from dark. Because Microscope depends on an order of play derived from the location of players in space around a table, we simply assigned one player to each cardinal direction and made a note of it in our administrative list on the left. As well as the session went, here are a few things I’d like to do differently next time. First, it should have been relatively easy to work our little compass rose into something that made it more intuitively, visually obvious who was to the “left” and “right” of whom. We also could have added a card showing the current Focus (we lost track at one point during the game when everyone took a break) and Lens, taking further advantage of the member-assignment function. As it was, I felt the need to keep track of all that on a sheet of scratch paper by my computer. Another thing I kept notes on was the character selection for Scenes; perhaps a temporary card (even a separate list, off to one side, to store those cards?) could have taken care of that for us. And finally, we had a relatively small number of acted Scenes and never used Push; how would we best take care of that without being able to see anyone’s fingers? I’m not entirely sure about that. It would be best to preserve the flexibility of finger-voting, with strength of preference between one and five; it would also be best to keep it free of influence, so simultaneous voting is required. Trello’s built-in voting system doesn’t allow for either of these – perhaps it would be best to have a voting list, or a voting space on some pre-existing list, with each player creating a card of their votes and then adding them together on the count of three. Beyond that, I’m sure there are a number of stylistic choices and minor adjustments that a group would need to work out. I suspect that the “card description” option – which didn’t catch my attention until after the session had ended – is better for notes than the uneditable “activity” item. It might be worth experimenting with giving each list a card below its title to contain detailed descriptions and a color tab for tone. As with any social game, the ideal way to play Microscope is still in person, with full access to body language and tone of voice, unfiltered by electronic media. If you must play at a distance, though, the combination of Trello and voice chat is a close fit to your needs. In the nearly two months since this was posted, I’ve played several more sessions of Microscope using the same combination. A couple games were interrupted by Trello’s site update schedule, but I’m happy to report that this was more of a break time than an outright inconvenience. And I have another screenshot showing how we’ve updated our play style. Note that we have added a card for the current Focus and Lens as well as a descriptive card for each Period (green label). We have not managed to find an easy way to make the compass rose for order-of-play more intuitively graphical, nor have we started using cards to keep track of Scene data; I find myself still referring to notes on scratch paper for a number of things. One peculiarity of the people I play with is that we have yet to use Push. I was wondering whether I should hold off on this update until we did, and worked out how to do the finger-voting online, but after two months and no clear gaming schedule I decided not to put it off any longer. It seems there are a number of ways this can be done; I’d love to hear from anyone else who has found something that works for them. This entry was posted in Nonfiction, Review and tagged Microscope, review, tech trial, Trello. Bookmark the permalink. Microscope is a joy to play. I have only done so in person, however, so I’m interested to try out your method. Having the right tools at hand would certainly make a difference. Trello looks like it’s still going strong, and there are any number of voice chat options available these days. Any new insights on playing Microscope remotely? No real new developments after the Update, in part because I moved back to the States from Japan and scheduling games, even online, became more problematic. If you manage to try this out and come up with any useful tweaks, I’d love to hear about them! I haven’t played but it sounds like, if you can live with an extra list for people, the play order can be represented by having a list of cards, one per person. The person at the top of the list is first, when their turn is over move them to the bottom. As play continues and others are moved below them they’ll rise back up to the top again for their next turn. That’s certainly a possibility! It probably all comes down to spatial issues – even without an extra list, you could easily fit that onto the left-hand “administrative bar” without it going offscreen if, for example, everyone just remembered the colors instead of having separate cards as a reminder. I am only just looking into playing Microscope on Trello. One nice thing about Trello now is you can add image attachments and set one of them as a card cover. Perhaps with a little time in a basic image editor you could create a visual compass-rose and attach it as card cover for quick reference? Thanks for letting me know about the updated functionality. Sounds like a good idea – and one that could be exploited to make cards more evocative in general! I already like the idea of a Microscope variant where a player, on their turn, could contribute an element to a map instead of, or as well as, making a period, event, or scene. Adding images is a bit different, but it could help with the world-building for sure. Unfortunately, these days I’m busy with grad school and haven’t been able to make time to play, but it’s something to keep in mind!